The cover of this book is, at first glance one of the better ones in the series. It depicts Tom Swift working away at a large control board controllingÖwell, just what he's doing is not apparent, but it looks important and exciting. After reading the book, however, I realized that the cover made absolutely no sense. There's Tom, inside his Challenger (no, that isn't the laboratory in the Great Salt Lake desert -- see the picture on page 163 and compare), on some lonely asteroid. That purple object has to be Planetoid Pete -- but what is it doing out in space, landing on a planet? Moreover, Pete is 1km wide -- and yet the Duratherm Wing (which, inexplicably, is above -- not underneath -- the planetoid) seems to be many times its size. And what are those bright colors coming off the top of the Wing? This book (which is considered by many to be the last Tom Swift Jr. book) is one of the most fascinating books in the series. There are a large number of fascinating points brought up in this book, some of which are Tom's latest invention, the colonization of a planetoid, and the impact of a meteor. The main invention in this book is the Duratherm Wing. The Duratherm Wing (which is pictured, albeit strangely, on the cover) is an amazing feat of chemistry that has a wide range of uses. Its main purpose was to aid in bringing rockets back to Earth, but it also has other uses. "What kind o' contraption is that in there?" Chow asked, peering through the pane intently. "A reentry device for spacecraft," Tom replied. "It's called a Duratherm Wing, or Durathermor for short. 'Dura' because it's made of my lighter-than-air foam plastic, Durabuoy, and 'therm' because it uses heat from air friction." "What's it suppose t' do?" "Get the spacecraft safely down to the ground from orbit. The Durathermor will serve as a heat shield to keep the craft from burning up in the atmosphere, and also enable it to be steered down to a precise landing, like an airplane." "Can't you do that already?" Chow queried. "Sure, in my repelatron spaceship. But rockets and space capsules are different. Most of them can only reenter the atmosphere like a bullet and it's not easy to maneuver a bullet." Tom explained that his Durathermor could be fitted to the nose of shuttle-ferry rockets making repeated trips to and from space stations. Even more important, it could be used to rescue disabled spacecraft, stranded in orbit. "How in thunder would you do that, boss?" "Well, a rescue ship would go into orbit beside the disabled craft. Then an astronaut would get out, lug the Durathermor across the void, and attach it to the stranded spaceship." Chow scratched his double chin. "Be purty big fer one man to handle, wouldn't it?" Tom chuckled. "The wing wouldn't be opened up yet. The whole apparatus would be neatly stowed in a compact, fairly lightweight package." He explained that before firing a retro-rocket to plunge the ship into the atmosphere, the astronaut would trigger a tiny cartridge of highly volatile liquid. This liquid would vaporize, causing a fabric sheath to balloon out in the shape of the wing. Then Durabuoy would foam out of a tank and fill the sheath. "I guess you know how hot a spacecraft gets during reentry," Tom went on. "Brand my stew kettle, I sure do! The whole ship glows like red-hot stove lid." "Much hotter, actually. Air friction can shoot the temperature above 20,000 degrees Fahrenheit. But my Duratherm Wing will stay fairly cool." The secret of the cooling, Tom explained, lay in a myriad of tiny semiconductor heat cells -- somewhat like radio transistors -- embedded in the fabric sheath. These would convey much of the heat into electricity, which would then be stored in batteries for use later in the flight. Chow went back to his galley and brought a lunch cart, then stayed to watch as the wind tunnel test continued. He saw Tom and Arv turning small control knobs. These caused the nose and wing tips to curl up and down, or the twin tails to curve slightly from side to side. "How do you make them thingamabobs curl thataway, Tom?" the cooked asked, puzzled. "Well, the Durabuoy is allowed to absorb just enough heat to become slightly pliable. But the actual bending is done by fine bimetal strips that are woven right into the fabric." Chow squinted. "What kind o' metal?" "Bimetal -- actually two separate kinds of metal bonded together. The storage batteries are used to heat them by electrical resistance. One metal expands more from the heat than the other, so the strip curls slightly. It's the same principle that moves the needle of your oven thermometer. And when al the strips curl, they exert enough force to flex the wing surface." "Wal, fry me fer an oyster! An' that's how you aim to steer an' fly the whole contraption?" "Right." Tom added that his Durathermor also had a special emergency crash-landing device, which was activated somewhat like the wing. As he pressed a button, the cylindrical package on the Firefly's nose opened. The huge, glistening fabric sheath slowly inflated to its delta-wing shape and the twin tail booms streamed aft. "Now the Durabuoy foam is gushing into the sheath and hardening," Tom radioed. "As you can see on your monitor screens, the wing encloses and shields the whole forward end of our craft. But during reentry a small portion of the wing will purposely be allowed to burn away, to provide pilot visibility during the landing maneuvers." In short, then, what does the Durathermor do? The Duratherm Wing, for all practical purposes, turns a multi-stage rocket into an airplane by temporarily giving it wings upon reentry. With these wings, the rocket can to a limited degree maneuver, land, and thus be reused. The Wing's cooling method is especially brilliant: not only can it withstand the tremendous heat of reentry, it can actually harnesses that heat to generate and store electricity for later use. The Duratherm Wing has another use, however, as an air bag for airplanes. In the book, "Eldorado Airlines" contracted Tom Swift to install a slightly modified Duratherm Wing on all their aircraft. The Wing proved its usefulness when one of their planes, newly equipped with a Duratherm Wing, crashed in the Rocky Mountains. Normally, of course, such a crash would almost certainly kill all on board. The Duratherm Wing, however, saved the day by cushioning the impact to the point where the plane was saved. "Exactly how does it work?" one of the board members asked. Tom explained that for aircraft use, the device would be mounted in a small pod under the nose of the plane. Using the easel chart in the conference room, he sketched out its operation. "The pilot would trigger the device as soon as he knew that the plane was about to crash," Tom said. "This would fire a breaking rocket to slow the craft's fall." "The same blast would eject a fabric sheath with a foreword, slightly whirling motion. Part of the rocket's exhaust would be used to balloon out the sheath. Then plastic foam -- the same lighter-than-air Durabuoy used in my Duratherm Wing -- would gush out and solidify inside the sheath." Tom illustrated the result on the chart pad -- a huge, mushroom-shaped Durabuoy crash shield foreword of the plane's nose. "With its lighter-than-air buoyancy, this would act as both a balloon and a parachute and further help to slow the plane's fall," he went on. "At the actual moment of crash, the cellular structure of the foam mushroom would shatter and absorb most of the shock." Why would Tom want to invent a Duratherm Wing? According to the book, the bulk of Swift Enterprise's cargo ships were the normal, pointy-nose type rockets, just like all the other rockets used in science fiction during the early 1960's (think of Tom Swift's Star Spear, which he built in Tom Swift and his Rocket Ship). Back then, the idea of a Space Shuttle hadn't really gotten around yet. Instead, the science fiction books of the time had their characters building what basically amounted to a Space Shuttle minus the wings. Now, landing these bullet-like vehicles was a tremendous task -- and Tom Swift realized this. He wanted to create a way to make his rockets more maneuverable -- and thus dreamed up his Duratherm Wing, which did the job nicely. One may ask (and rightly so) why his amazing repelatron drive wasn't used. The repelatron, after all, was the last word in maneuverability. Equipped with one of these, a spacecraft could have landed anywhere with pinpoint precision. I did think of a few reasons, though: the drive might have been extremely expensive to manufacture, the drive might have been too large and heavy for ordinary cargo ships, or the drive might have cost too much to use for everyday purposes. Who knows? How feasible is it to build a Duratherm Wing? It's hard to say. Piezoelectric materials (that is, materials that convert heat into electricity, as was done with the Wing) do exist today, so there's no problem there. The amazing Durabuoy foam, however, is another matter entirely. I won't say it's impossible to build, but I will say that it's an amazing feat that isn't likely to happen anytime soon. I mean, think about it: here you have a super-strong, lightweight material that can resist tremendous heat and, if impacted beyond its limit of strength, will literally fall apart at the molecular level and thus absorb all force of impact. Moreover, it's lighter than air. That's what bothers me most about this invention: how would you make it lighter than air? To make it lighter than air, you would either need to make it out of very light gases (which wouldn't work), or you would need to make it hollow (and it certainly isn't, not from the description Tom gives), or you would need a really exotic molecular structure. Somehow, though, this is one I can't believe. Maybe something along the lines of a Duratherm Wing can be thought of, but it certainly won't be lighter than air. How much impact would a Duratherm Wing have on civilization? The Duratherm Wing would probably find a good market in today's world. One-shot rockets, if equipped with a Wing, could possibly with a little re-design work become cheap, multi-shot rockets, thus saving hundreds of millions of dollars. It's the airline industry, though, that I think would line up in droves for this device. I mean, think about it for a minute. Today, if a plane loses its engines or goes into a nosedive or loses a wing there isn't a chance in the world that the plane will come through intact, and it's almost assured that everyone on the flight will die. Sure, a plane might have a lot of safety features, but if something serious goes wrong during the flight you are in big, big trouble. A Duratherm Wing, however, could cut down drastically on casualties by drastically softening the impact. No other device currently on the market actually provides protection for an aircraft after something major has gone wrong. This device would actually give passengers a chance if, say, the plane's electrical system died. Hundreds -- perhaps thousands -- of lives could be saved. Air travel would be made much, much safer, all with the installation of a small, simple, easily maintainable device in the nose of the plane. Another major item in this book was the colonization of planetoid Bartonia. In the previous book (Tom Swift and the Mystery Comet), Tom Swift had an intriguing idea: why not turn a near-Earth asteroid into a spaceship, outfit it with a crew, and take a trip around the sun? 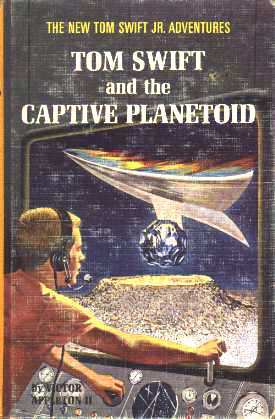 In this book, Tom Swift turned this idea into reality with the planetoid Bartonia. What are some details about the project? First of all, as I said, Tom Swift thought up this idea in the previous book. Nothing was done at that time, however, for various reasons. In the beginning of this book, Tom Swift Sr. tells Tom that he spotted a planetoid (which he named Bartonia after his father, Barton Swift) that might do -- and from there the project is launched. Tom went about this project in three stages. First, Tom located a suitable near-Earth planetoid. Next, Tom Swift flew to the planetoid with a large crew and plenty of supplies and proceeded to hollow it out with his atomic earth blaster (see Tom Swift and his Atomic Earth Blaster). Finally, Tom unloaded the crew and the supplies, and after outfitting the planetoid, he returned to Earth. "What's this planetoid project your mentioned, sir?" Bud asked the elder scientist. "Well, as you know," Mr. Swift began, "planetoids are small bodies which revolve about the sun. We often call them asteroids, but that name is misleading because asteroid really means 'little star.' The official name of a planetoid is 'minor planet.' Most of them orbit in a belt between Mars and Jupiter." "Some of them revolve nearer to the sun than that, don't they?" Bud inquired. "Yes, indeed, and some have orbits which cause them to pass very close to earth--occasionally even between the earth and the moon. Unfortunately, astronomers have no organized search program for these close-approach planetoids." "A dozen or so have been spotted," Tom put in, "but each one was sighted by sheer accident." "What sort of project do you have in mind, sir?" Bud persisted, turning back to Tom Sr. The scientist toyed thoughtfully with a pencil. "I suppose the idea has been kicking around in my mind, and Tom's mind too, ever since the phantom satellite first appeared in our sky." He was referring to the asteroid Nestria, which had been moved into orbit around the earth by unknown space beings. (Tom Swift on the Phantom Satellite) Tom Jr. had led a space expedition there and planted a base. Mr. Swift went on. "After you two made your recent comet landing, the idea came back to me strongly; namely, that it was high time to begin a real research program into the wider use of planetoids as space bases." "Wow!" Bud exclaimed excitedly, "That could open a whole new era of space exploration!" "You bet it could!" Tom plucked a technical aerospace journal off a shelf and handed it to Bud. "Dad wrote an article for this journal, suggesting some of the things that might be done." Bud located the article and glanced through it hastily. "Jumpin' jets! Do you think you could really capture a planetoid and steer it into earth orbit, the way the space folk did?" Mr. Swift nodded. "Why not? I'm sure the energy requirements for nudging a close-approach planetoid into earth's gravity field are well within man's present scientific potential. Of course it would take careful planning to insure against any unforeseen catastrophe. Meantime, a planetoid research program might yield all sorts of important results." "Results such as data on the makeup of planetoids, clues to the mystery of how they were formed -- perhaps even clues to the origin of the solar system. And traces might be found of simple life forms, such as spores from elsewhere in space, that would tell a lot to biologists. Also, attempts could be made to extract rocket fuels from the planetoids, like oxygen and hydrogen, as well as the structural materials." Mr. Swift smiled. "However, the most exciting possibility of all is one that Tom proposed." "Let's hear it!" Bud said eagerly. "Tom convert a planetoid into a sort of natural spaceship for an orbital voyage about the sun." "Dad!" Tom almost leaped from his chair as he sensed what was coming. "You don't mean you're thinking of actually tackling such a project?" "That's just about what I mean." Mr. Swift's expression reflected his son's excitement. "I didn't want to mention it before and arouse your hopes too soon, but I've been corresponding with some of the top government space planners on the subject. They're all for it, and they're willing to underwrite half the cost as soon as we pick out a suitable planetoid for the project." Tom gave a joyful whoop. "Wait!" Bud blurted out. "Let me get this straight! You're talking about planting a group of astronauts on one of those tiny hunks of real estate and letting them swing millions and millions of miles away from the earth?" "That's right," the distinguished scientists replied. "Such an expedition would provide priceless experience in survival techniques for an extraterrestrial colony in deep space--something we may one day have to undertake on a large scale as earth's population increases." "How long would the astronauts be gone?" "Two or three years, depending on the orbital period of the planetoid that was chosen." How was the colony designed? For practical reasons, the colony on Bartonia was placed inside the asteroid in a large natural cavern. Basically, the cavern was partitioned off, floors were put in, an airlock was put at the mouth of the cave, and that was that! Work was started at once to convert the huge underground chamber into a permanent home for the space voyagers. A bank of Tom's solar-charged batteries was taken below to provide electrical power for lighting and machinery. A prefab air lock was soon rigged at the inner end of the tunnel. Then tanks of compressed air were opened to fill the cavern with a breathable atmosphere. The underground chamber had been converted into comfortable living quarters, with bunks, galley, recreation area, and workshop. Air recycling equipment had been installed and tanks laid out for hydroponic farming. There was even a television screen for viewing programs relayed from the Swift's space outpost. The first three cargo capsules had been set aside as a special; research laboratories. Among the supplies brought on the second trip was a large telescope and complete equipment for an astronomical observatory. Mr. Swift was much impressed by what he saw. How feasible is it to colonize a planetoid? The difficulties with colonizing a planetoid are similar to the ones involved with colonizing anything. Where do you get power? How do you get oxygen? Where do you get your food? How do you dispose of wastes? What do you do if something goes wrong? If you can solve these problems and get a colony on, say, the moon, then I think that you can build one inside an asteroid. I do have some doubts, however, about Tom Swift's method of colonization. If you'll read the above passage carefully, you'll notice that the entire project was undertaken just as if it was a short-duration mission. Oxygen and electrical power, for example, were imported from earth, and no equipment was provided to enable the colony to make its own. While this will work for short missions, it invites disaster in long trips. For example: what do you do if you have an oxygen leak? Since you can't manufacture your own, you're just out that much oxygen -- and if you loose very much oxygen, you're dead. And what do you do if one of your batteries loses all of its electrical power? Sure, help might be able to come and get you, but if you're millions of miles away from earth it might not make it in time, and where would you be? Self-sufficiency, then, is the only way to go for long missions like this one, especially if there's no one to rescue you. Don't leave home without it. Why would anyone ever want to colonize a planetoid? There are many reasons to colonizing a planetoid. First, if for nothing else, I'm sure the mining industry would love to get their hands on a few planetoids -- I hear some of them are extremely rich in minerals. Now, most of the solar system's planetoids are in the asteroid belt. If you wanted to start mining asteroids, obviously you would need a nearby base -- and the most obvious place would be a large, hollowed-out planetoid. Planetoids would also be a good place to test life-support systems in a near-zero gravity environment. They would also be the place to set up low-gravity factories. In fact, they would really be good for any kind of base, as they're so cheap to deal with. To build a space station requires a tremendous amount of money, time, and other things. There is tremendous complexity involved. Hollowing out a planetoid, however, is a much, much simpler -- and cost effective -- task. Still, there's another idea behind all of this that Tom Swift just started tapping into: the use of a planetoid as a spaceship (as was done in the Dig Allen book "The Forgotten Star"). Bartonia admittedly had a pre-set course, but what if you were to put an engine on it? You could theoretically build some tremendously roomy spaceships at very practical costs. I mean, which is easier: building a 1km-long spaceship from the ground up, or hollowing out a chunk of rock and putting an engine on one end? If you chose a mineral-rich asteroid, all of the metals (and perhaps fuel) you'd need would be right there -- you'd just have to assemble the ship and be off. Admittedly it would be more work than that. It would take a good deal of time to both build the colony and get it self-sufficient. The engines, too, would be a fantastic challenge to build. Still, it's a neat idea, and one that I expect will eventually turn into reality. Another main item in this book is the Planetoid Petronius. In the beginning of the book, Tom runs into an astronomer who tells him that a planetoid has strangely veered off its course. Tom, intrigued, decides to investigate the matter by taking a trip to the planetoid to test his newly modified Atomic Earth Blaster. While there, he makes a tremendous discovery: the planetoid has a core of solid sapphire! Later, Tom finds out that the veering of the 1-km-long Planetoid Pete was no mistake: its orbit had been calculated a group of fanatics who want it to strike the Earth and cause massive devastation. Tom, then, must save his country! How does he do it? Very carefully, it turns out. The spaceship was moored again, and Tom's atomic earth blaster was hauled outside to a suitable drilling site. A launching rig was set up and anchored to the rock with explosive bolts. Then the torpedo-shaped blaster was positioned nose down in the rig. By this time Petronius' brief night had fallen, so Tom called a halt. The astronauts returned to the Challenger to eat and nap. As Chow served a hearty meal, Tom explained the drilling operation. "You see, with the planetoid's low gravity, the blaster would tend to rebound out of the drill hole instead of grinding up the rock effectively. So I've added the magnetic clamps to hold it tight to the walls of the shaft." "Then how can the blaster move along and keep drilling?" a crewman asked. "It operates in pulses," Tom replied. "The current to the electromagnets flows only while grinding is going on. When the ground-up rock is spewed out of the shaft, the current shuts off. The heat reaction drives the blaster forward until it presses against solid rock. Then the pressure switches the magnets on again." The blaster was bracketed slowly out of the drill shaft. While most of the crewman remained at their posts, Tom took off in the Challenger. He maneuvered the huge ship aloft so as to aim the microwave beam from its telesampler gun down into the drill hole. When the beam was reflected, it would carry back particles of the substance at the base of the shaft." Did you get that? Tom Swift needed to know what was stopping his earth blaster. Now, I might have taken a geologist's pick and broken off a sample, or I might have taken out a portable telesampler and beamed up a piece. That's not what Tom Swift did, though. He took off in his Challenger, moved the entire spaceship until it was over the hole, and them beamed a piece up. Talk about cracking a peanut with a sledgehammer! Tom swallowed hard, realizing that countless lives might depend on his efforts. "Yes, I still think we can bring the planetoid down to a controlled landing, Dad. But I'm not sure I can give you all the answers right now." Frowning, the young inventor paces back and forth near the conference table. "It's a cinch we'll need more than one method to do the job," he mused aloud. "The Durathermor technique will just give us a start on the problem." Mr Swift looked doubtful. "You certainly won't be able to impart much aerodynamic lift to a mass as big as Petronius." "Not with the kind of wing I used before," Tom agreed. "But a parasol-mounted delta wing would at least give us some control. And a Durathermor drogue chute, combined with braking rockets, could partly slow its fall." Tom sat down and grabbed a pencil and paper. "Look, Dad! We'd have to time our operations to the precise second, but here's how we might do it. The chute and rockets would slam on the brakes, but only temporarily. Now, if we set up powerful repelatrons, we could spear the planetoid with our repulsion beams--before it could build up velocity again." "Hey!" Bud exclaimed. "Why not use repelatrons right now and kick Petronius back into a stable orbit?" Tom shook his head. "Too late for that, I'm afraid, in view of what Dad and Dr. Volenti have told us about the effects of the Van Allen belt." "Think how many megatons of H-bombs it took to move Petronius in the first place. To get enough effect, we'd have to keep pouring power with our repelatrons for a long period of time." "So keep pouring!" Bud urged. "No used. It would be like putting water into a sieve. Petronius was on a three-hour orbit; but the orbital time is shorter now than the planetoid's sinking. Much of the time it's passing through the Van Allen belt. That would drain off its orbital energy as fast as we could feed it in. Right, Dad?" The ender scientists nodded. "If our calculations are correct, that answer is hopeless." Bud scratched his head. "Okay, then how about using H -bombs?" "Too risky at Petronius' present altitude," Mr. Swift replied. "The effects of radioactive fallout would be impossible to predict." "Back to you then, genius boy," Bud said, turning to Tom. "Tell us the rest of your plan." "Well, once we braked the planetoid inside the atmosphere, repelatron beams could keep its rate of fall from accelerating too dangerously." "Even so, there'd still be a terrific seismic shock from its landing," Dr. Volenti warned. "True," Tom conceded. "But we could do a switch on the Durathermor crash-landing technique. I mean, instead of using a crash shield to protect the falling object, we put a shield on the ground itself." Volenti and Mr. Swift bent over the table eagerly. "How do you mean, son?" Tom penciled a quick sketch. "We build up a mountain of Durabuoy foam beforehand at the exact spot of landing. Of course much of the rocky crust of Petronius would burn away during entry. When the sapphire cure hits, the foam mountain will shatter and melt. The impact energy will be turned into heat an spread out safely over a large area of the desert." Mr. Swift and Dr. Volenti exclaimed their approval of Tom's plan. "Son, this gives us a real hope of staving off disaster!" "I see no reason why the plan won't work." The astronomer chimed in, "providing our calculation s are sufficiently precise." "Does the Defense Department know of the danger yet, Dad?" Tom asked. "Yes, we notified Washington early today, but we'd better call again and explain your plan." "How long before Petronius hits?" "Ten days by our estimate," Mr. Swift replied. Tom gave a worried whistle. "Then we'd better get cooking fast!" The young inventor hurried to his laboratory and plunged frantically into work. He decided that four super-powerful repelatrons would be required for the planetoid landing. These and the Durabuoy mountain posed no technical problems. "Hank Sterling and Arv can handle them," Tom decided. He called the two into his laboratory and explained the requirements. "With round-the-clock shifts, we can have the repelatrons ready in a week or so," Hank promised. "Where's the landing to take place?" "The Great Salt Lank Desert in Utah." "After Hank and Arv had left, Tom turned his attention to the Durathermor equipment and electronic gear needed for the planetoid operation. Scarcely pausing to nibble lunch from a tray, he worked on through the day. It was almost midnight when Tom finally left his drawing board and went to bed. Two odd-looking helicopters were skimming back and forth, each squirting out a ribbon of Durabuoy, like toothpaste from a tube. Tom told Chow this was to build up a huge flat-topped mountain of the white plastic foam. The young inventor had used similar craft to lay an aerial road above the Ngombian jungle in Africa, as related in Tom Swift and his Repelatron Skyway. Soon the Challenger was zooming aloft. Tom steered it into orbit alongside the tiny, hurtling planetoid, then landed gently. Two holes were bored through the rocky crust--one at the stern end of Petronius, the other in the side facing away form earth. The Durathermor drums were lowered into the holes and firmly anchored against the sapphire core. Finally a thrust chamber was drilled into the planetoid's nose and filled with rocket fuel. The tunnel, ten feet in diameter, had been specially designed by Tom to test the lift and drag characteristics of his Duratherm Wing in mid-atmosphere at speeds up to Mach 10. To create the airflow, pressure was built up at one end of the tunnel by multistage compressors and reduced at the other end by a vacuum pump. Did you get that? Tom Swift had a wind tunnel that could get wind going up to Mach 10. Does such an invention currently exist? Is there any wind tunnel in the world that can generate wind speeds of even Mach 1? I'm none too sure. "With this MHD accelerator, I hope -- MHD for magnetohydrodynamic." Tom walked over to a row of apparatus. "This generates a flow of hot plasma -- like the plasma we encounter on reentry. At least it's as close to the real thing as we can simulate here in the lab." "Okay, I'm listening," Bud said with a grin. "Clue me in on how it works." "Well, air is pumped through this arc heater, where it heats up almost to plasma temperature. Then it goes through this chamber, where it's 'seeded' with particles of cesium." "Great. What does that mean?" "The cesium ionizes quickly and changes into a true plasma, by having electrons jarred loose from its atoms. And this, in turn, helps to ionize the air and turn it into plasma as it flows through the MHD accelerator." Tom pointed to a tubular chamber made of the same tremendously strong glass used in his deep-sea aquarium. It was would with Dewar-jacketed coils and enclosed in a C-magnet. "What happens there?" Bud asked. "Those coils are superconducting, and so are the C-magnet's coils. One pumps energy into the seeded hot air to change it into plasma. The other sets up a containment field to confine the plasma. The plasma jets into this exhaust stack."